Finding water on Mars is nothing new. Scientists have known for years that water (as ice) lies in the polar caps and underground in high latitudes. However images from the High Resolution Imaging Science Experiment (HiRISE) camera on NASA’s Mars Reconnaissance Orbiter (MRO) have captured something new. These are dark finger-like lines on steep slopes that appear during the warmest time of year. They are most likely caused by flows of salty water. In a paper published in the journal Science (August 5, 2011), Alfred McEwen (University of Arizona) and colleagues describe “recurring slope lineae” (or RSLs for short). These lineaments occur in the middle southern latitudes on slopes facing the equator and which are steeper than 25°. They appear and grow incrementally during southern spring and summer, then fade and disappear over the winter. HiRISE has imaged them recurring in the same places for several Martian years. 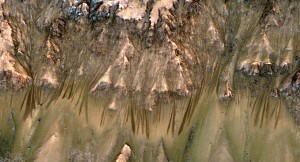 Pure water can’t survive at the Martian surface today (let alone flow), but brines are a different story. Laden with salts, they can remain liquid at temperatures well below the point where pure water freezes. Data from THEMIS shows that the ground temperature on the slopes varies from about –23° to +27° Celsius (–10° to +80° Fahrenheit). Although no direct relation is known, the seasonal lineations occur in the same latitude band as sites where chloride minerals have been found. The newly discovered lineations appear wholly different from the well-known dark streaks that appear on some slopes. The latter occur only in dusty areas and show no seasonal activity; they are thought to be dust avalanches. In contrast, the dark lineations are narrower, darker, appear and disappear seasonally, and recur from year to year in the same places. The scientists acknowledge that how the darkening process works and the brine’s source remain unknown. In addition, the CRISM instrument on MRO should have detected spectroscopic evidence of water, but it did not. “It’s a mystery now,” says lead scientist McEwen. “But I think it’s a solvable mystery with further observations and laboratory experiments. This entry was posted in Reports and tagged brines, carbon dioxide, gullies, HiRISE, Mars Reconnaissance Orbiter, recurring slope lineae, RSL, water. Bookmark the permalink.